Windstorm can result in various damages to a home or business, from blowing down trees to lifting shingles to complete destruction of a building by hurricane or tornado. All windstorm damage to buildings is usually covered under a first party insurance contract, however you should be aware that many modern policies have a “hurricane deductible” which comes into play when the loss meets that policy’s interpretation of a “hurricane”. Some policies use “named storms” as the basis for the much larger hurricane deductible while others use wind speed. Be aware that a hurricane deductible can be many thousands of dollars and is usually a percentage of the coverage on a building. Unless wind speed is the sole determination of the larger deductible, tornado damage to a building is usually covered under normal policy terms. A few policies will provide coverage for protection from damage BEFORE a hurricane, such as boarding up a building or moving a boat to dry land. Many clients call with regard to trees falling from wind. Most policies will pay whatever it costs to remove the trees from covered property, but only a small amount to cut up trees and take them away. 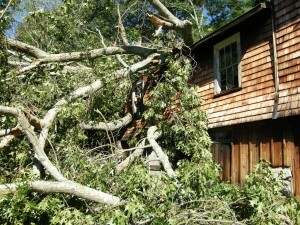 If a tree does not fall onto covered property, it may have no coverage at all. Damage to trees themselves is not usually covered under homeowner or most business policies. Under most policies, trees on fences qualify as falling on covered property. An interesting misconception of some people is that they feel when a neighbor’s tree falls on their property, the neighbor is responsible. This involves legal liability, which would be contingent upon negligence of the neighbor. Negligence has been held to mean the owner of the tree was aware that it was diseased or dead and presented a hazard, or that the tree was obviously in detrimental condition by reasonable inspection. Otherwise, you must depend on your own insurance for any coverage to apply. Note that water damage from wind and rain in a building does not usually apply to contents unless there first is an opening in roof or walls (caused by wind) that allows the water to enter through that opening. Lifting and tearing of roof shingles by wind is covered under most policies. However, how much of the roof the insurance company will allow is usually a problem, with some companies only paying for the shingles that are damaged, resulting in a mismatched roof. In this situation, a good public adjuster can be of valuable service.